The failed Tube maintenance firm Metronet has been taken over by Transport for London (TfL). The company, which was responsible for two thirds of the London Underground lines, went into administration last year after an estimated £2bn overspend. The firm's collapse sparked criticism of the public private partnership arrangements to upgrade the Tube. 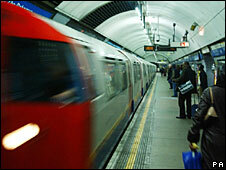 TfL took over the company at 0001 BST and pledged to invest in new trains, signals and station upgrades. "Since Metronet went into administration there has been a protracted period of uncertainty," said London Mayor Boris Johnson, MP. "This has resulted in the millions who rely on the Tube not knowing when the needed improvements would be delivered. "With Metronet now out of administration and under the control of TfL we can ensure that the crucial upgrade work is continued and delivered on time, while representing good value for the capital." Spending on the eight Tube lines that were previously Metronet's responsibility is forecast to be about £1.4bn over the coming financial year, TfL said. Tube Lines, the other Underground public private partnership maintenance company, continues to have responsibility for the other three lines.